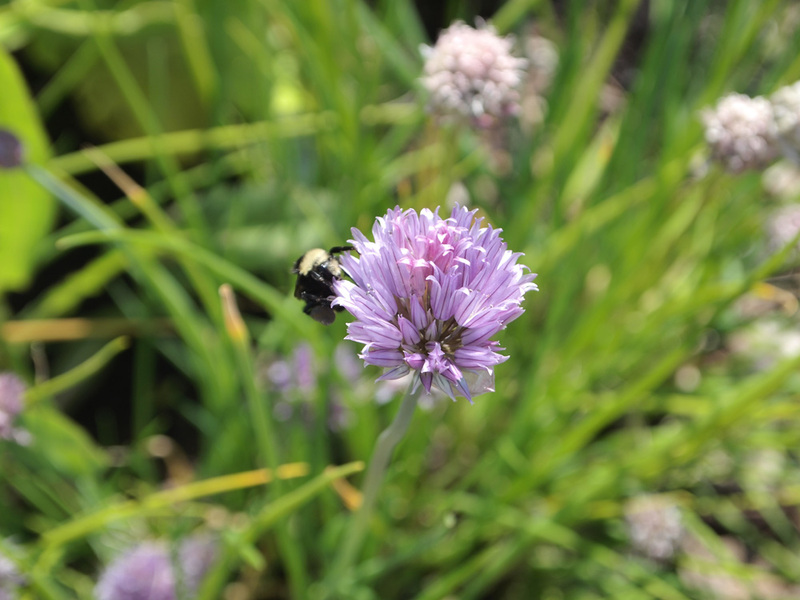 The chives we grew from seed last year came back much stronger this year - with lots of pretty chive blossoms! 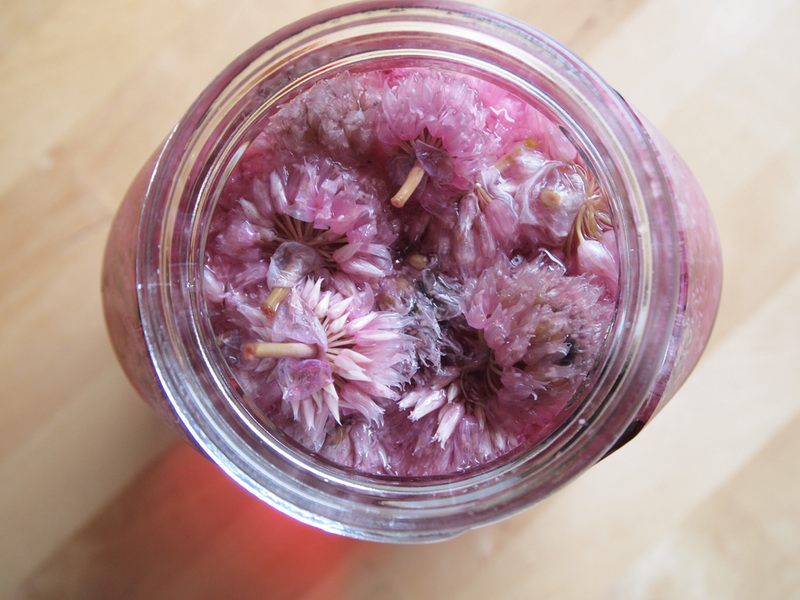 After seeing multiple recipes online for chive blossom vinegar, we decided we had to try making it. 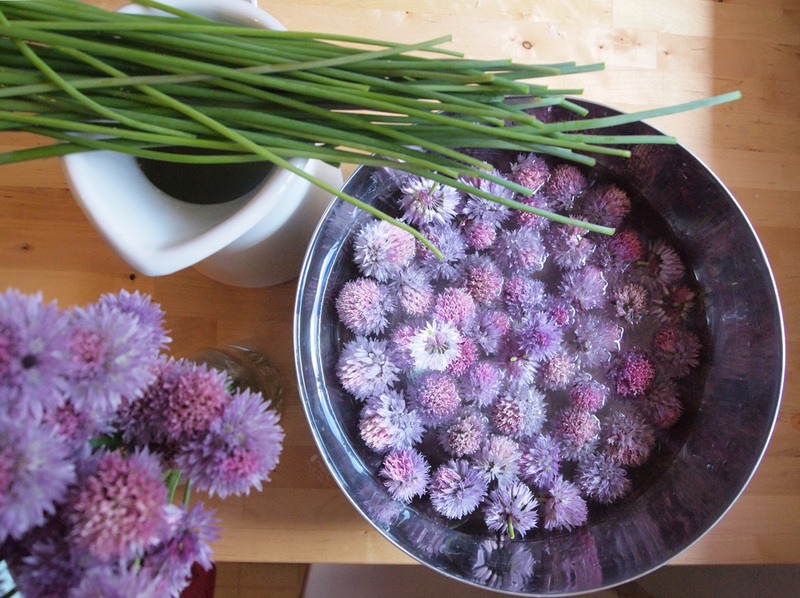 Like all flavored vinegars, making chive blossom vinegar is pretty easy - we just put a big handful of chive blossoms into a quart or so of vinegar. We used regular white vinegar because we have a huge jug of it for pickling, but I bet it would be really nice with champagne vinegar or white wine vinegar. After two weeks (and a nice chive bouquet), it was done. Don't let the pretty pink color fool you - it's too delicious not to eat! It has a really nice flavor that will be tasty in all kinds of things. And all from little seeds we planted in our garden! Every time we go to the garden, we're amazed at how well everything is doing! We thought we did pretty well for ourselves last year, since it was our first year, but since we started planting before May this year, everything is doing even better. We've also had a lot of warm days and sunshine, which is slightly unusual for this time of year. 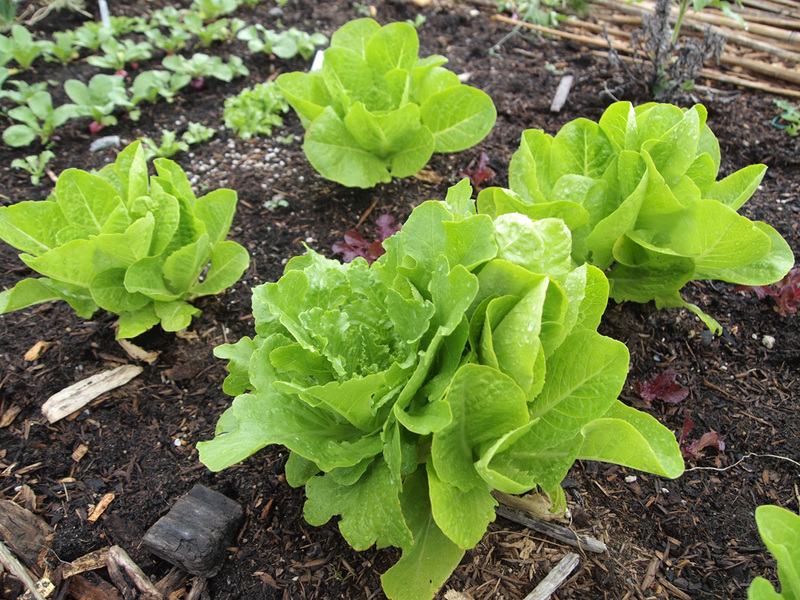 Our romaine lettuce is getting huge! We were going to pick one but decided to wait until later this week. We cheated a tiny bit and bought the lettuce as seedlings - tiny seedlings, but still seedlings! The stuff in the background is all grown from seed - our radishes are nearly ready. 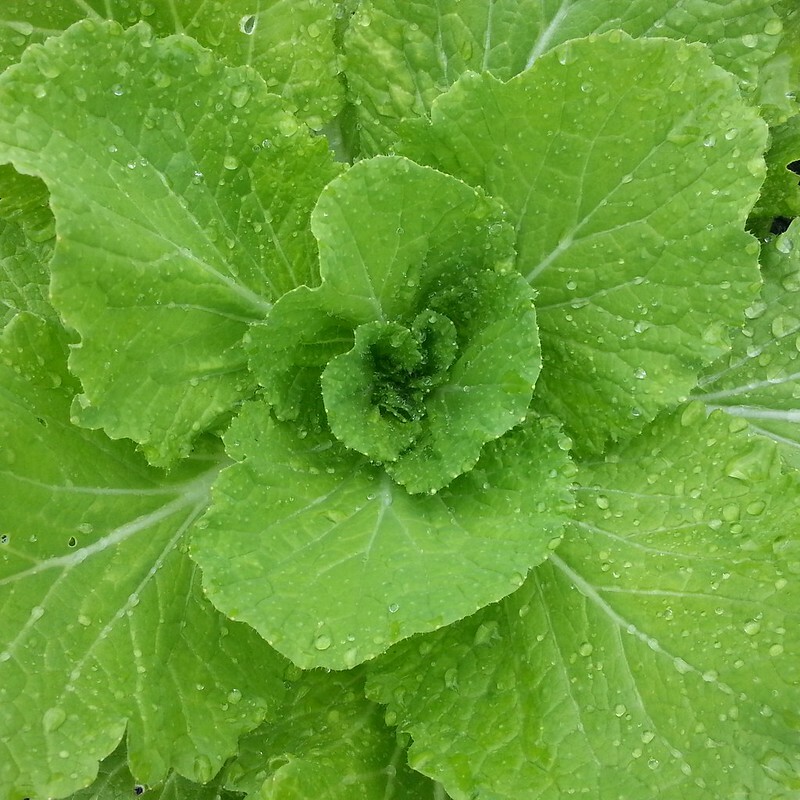 The escarole is coming up really well, as is the red leaf lettuce. 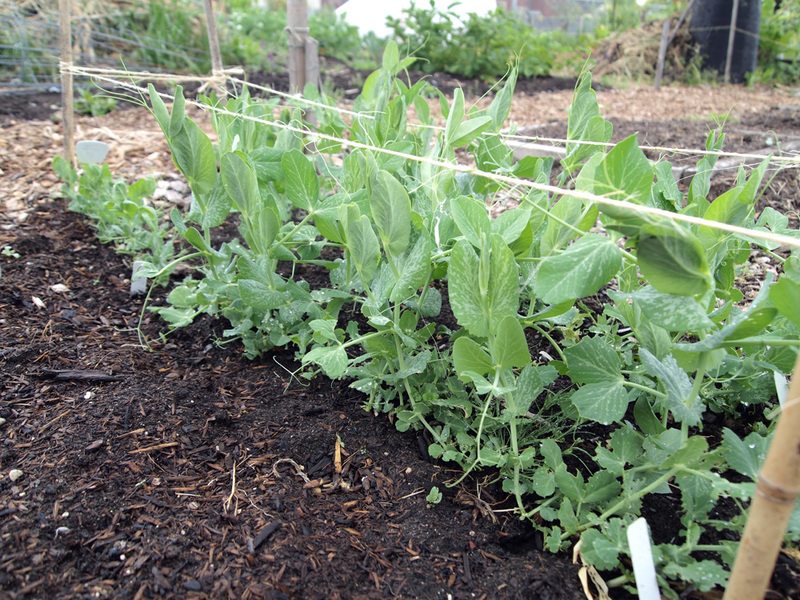 Snow peas! We're still behind some people in our garden, who obviously planted them in early March, but we're way ahead of where we were last year - we didn't even harvest any until late June last year. The tinier ones on the end are a different variety that we planted a week or two after the taller ones because we ran out of pea seeds! many beans last year...but we might have actually ended up planting more. Last year, we didn't realize how closely they could be planted (4-6") so we spaced them out really far. This year, Matt built a little bean arbor that goes over one of the garden paths, instead of an a-frame like last year. The whole middle of the a-frame was wasted space so this year - no wasted space! 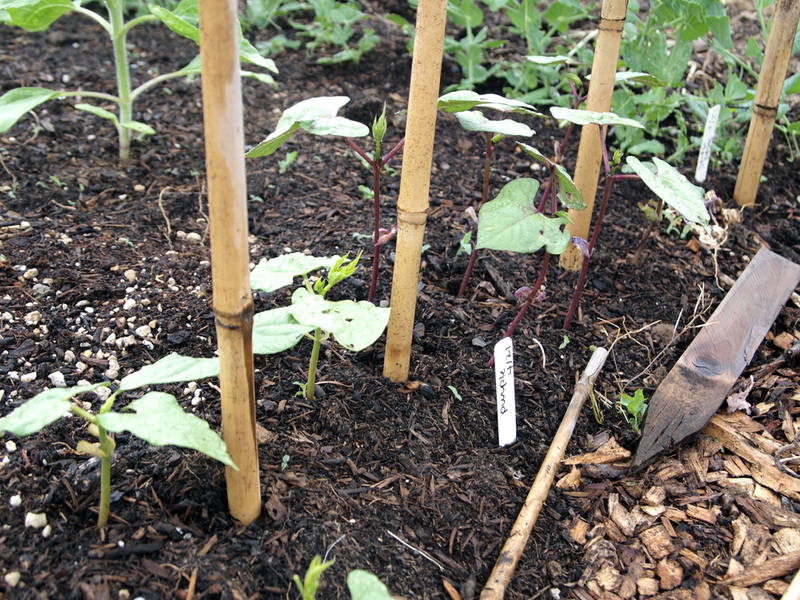 We planted the same two types as last year - Kentucky Wonder, a green one, and Purple Podded. And - our first harvest of the year. 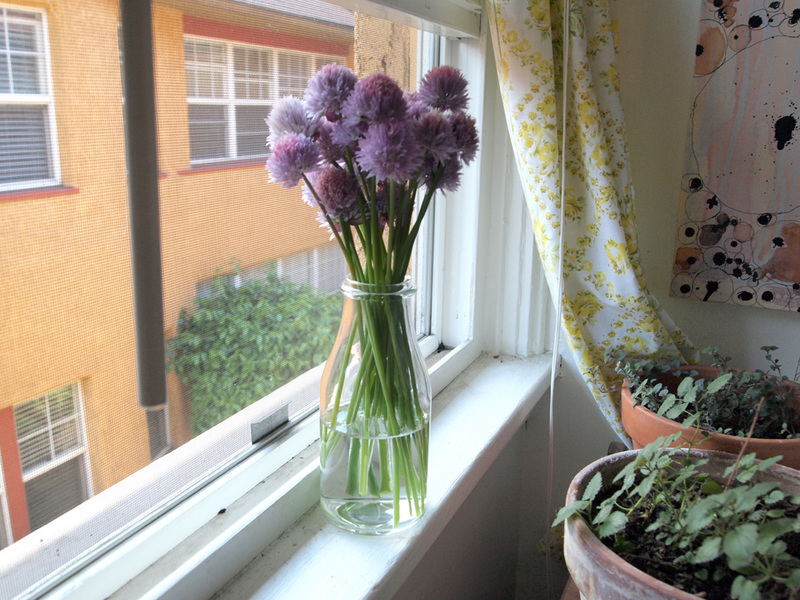 Only alliums today! 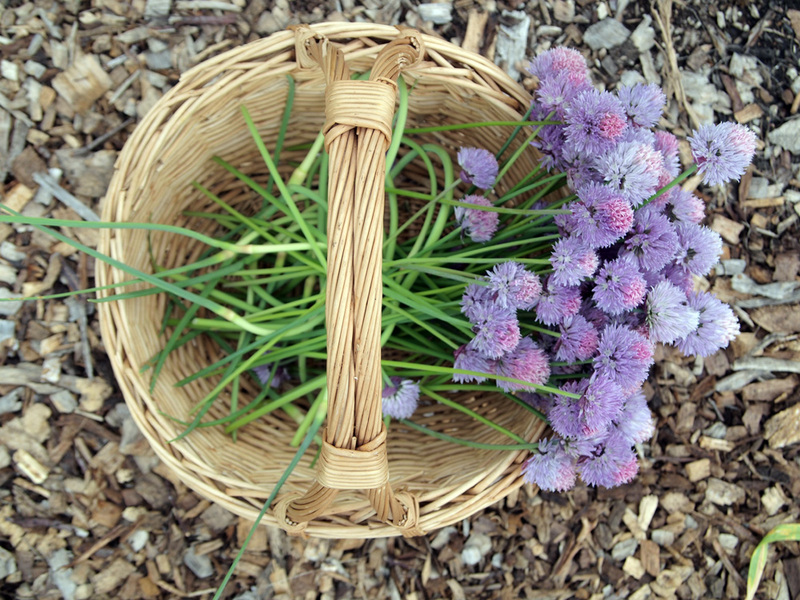 Garlic scapes and chive blossoms - two things I've never eaten in my entire life before. Garlic scapes come out of the top of the garlic plant and curl around before flowering. You're supposed to cut them off to encourage bulb growth, but they taste really good too. 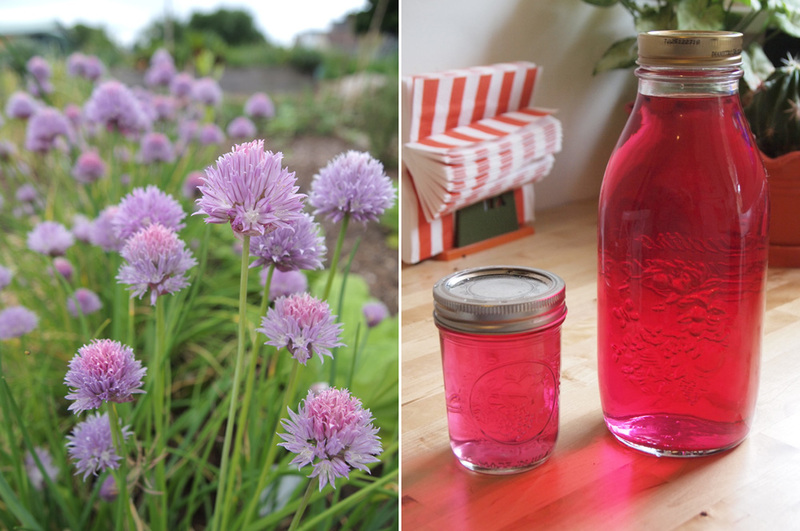 Chive blossoms are supposed to make a delicious pink vinegar, so we're going to try that. They also look pretty in a vase! We're just a little bit ahead this year! Although we had grand plans of having a winter garden and harvesting year round from our little patch of land, we didn't anticipate being quite as busy as we were in the lead-up to Christmas. We hardly had a spare moment to think, much less take care of our garden! Needless to say, we abandoned it for about four months (sorry, garden!) but finally steeled ourselves and faced what we thought would be an overgrown mess. It was indeed fairly overgrown, but the weeds were easy to pull out. 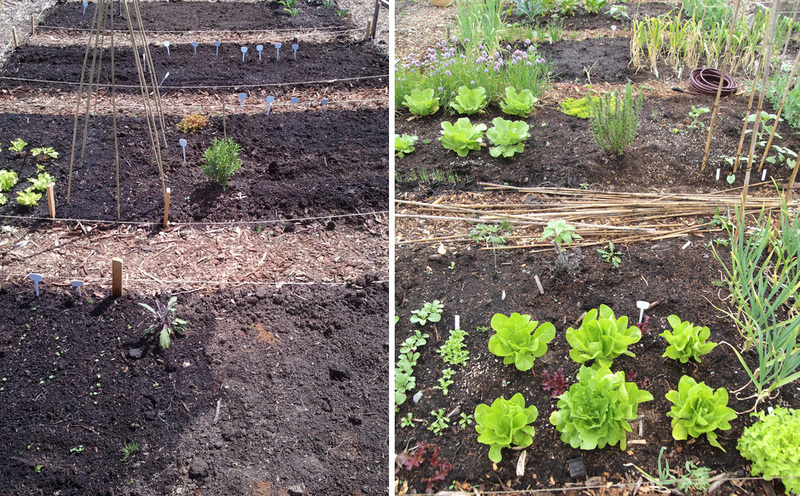 We spent a few hours weeding, adding compost, and planting seeds and now our garden is ready for spring and summer! Our first visit was about three weeks ago, so we've already got plenty of stuff popping up - arugula, lettuce, radishes, peas, spinach, chives, and green onions. Plus, we had a bunch of garlic and herbs from last year. We're so excited for the huge amount of garlic we're going to harvest, starting in a month or less! I hope everyone had a good Thanksgiving weekend! We took the opportunity to eat lots of delicious food, watch (English) football, and plant the last of our garlic in the garden. 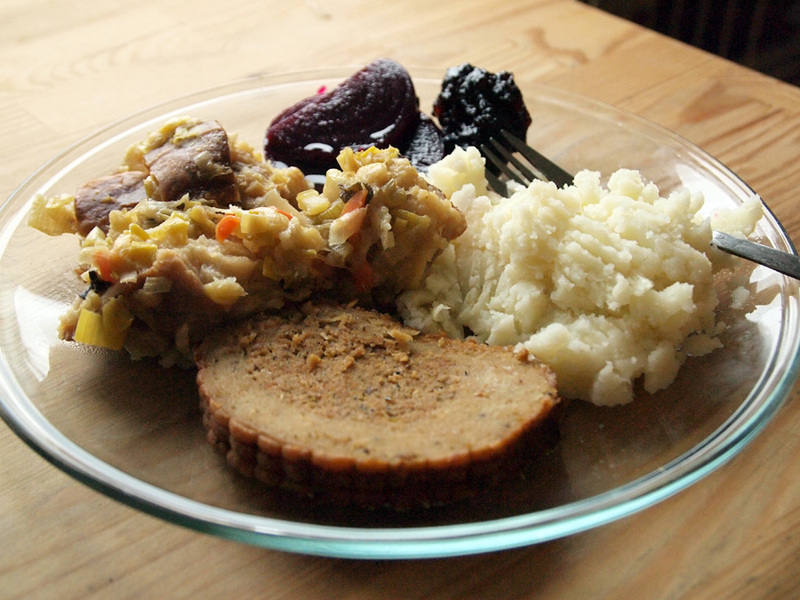 We made quite a feast for ourselves, seen above - field roast "holiday roast", roasted garlic mashed potatoes, leek and sourdough stuffing, pickled beets & cranberry sauce. Everything turned out really well, but the stuffing impressed us the most...we'd never made stuffing from scratch before! 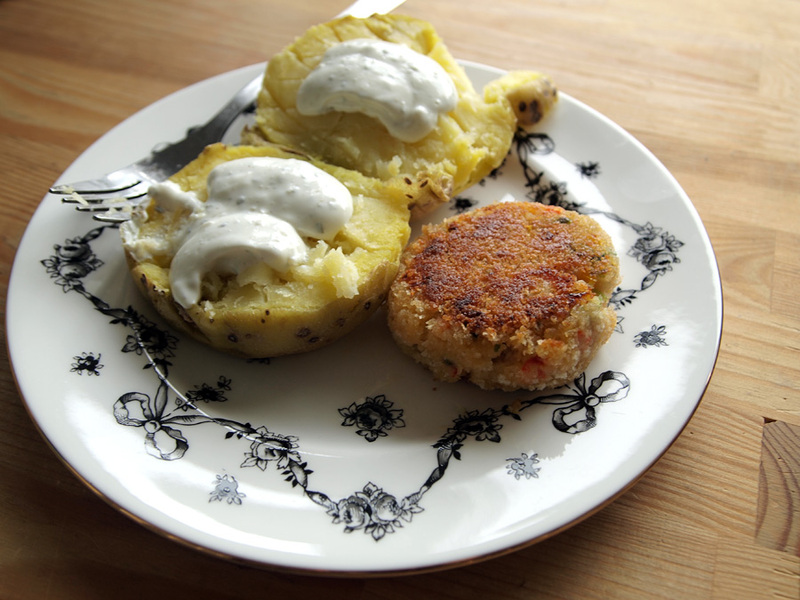 Our pre-feast Thanksgiving lunch was a baked potato and Dungeness crab cakes (delicious). 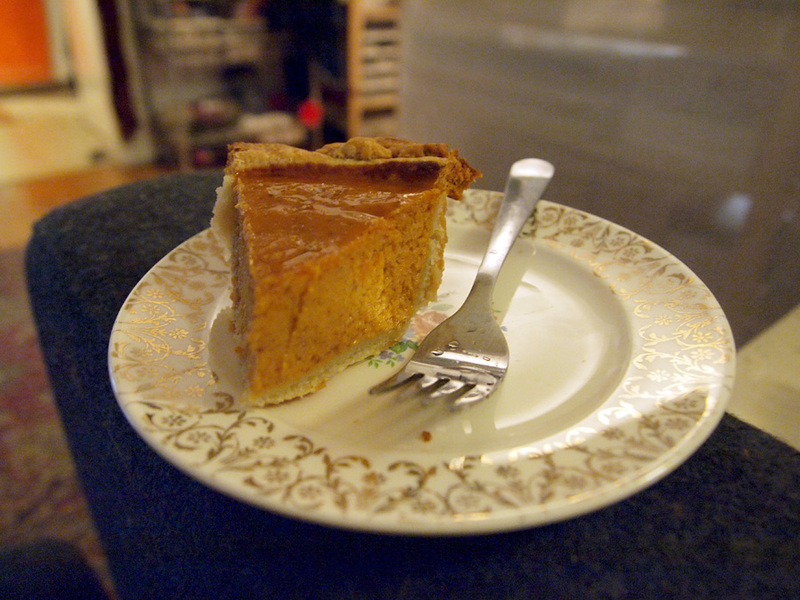 We also made a pumpkin pie in the mini pie pan I got for a birthday gift from my mom. It's only 7" across and made a perfect-sized pie for two people! It gave us 6 slices this size, which is all that we needed. The day after Thanksgiving, we made these vegetable squares - originally, they were supposed to be for the big feast too, but we had way too much food so we waited. They're puff pastry (made by a local bread company!) 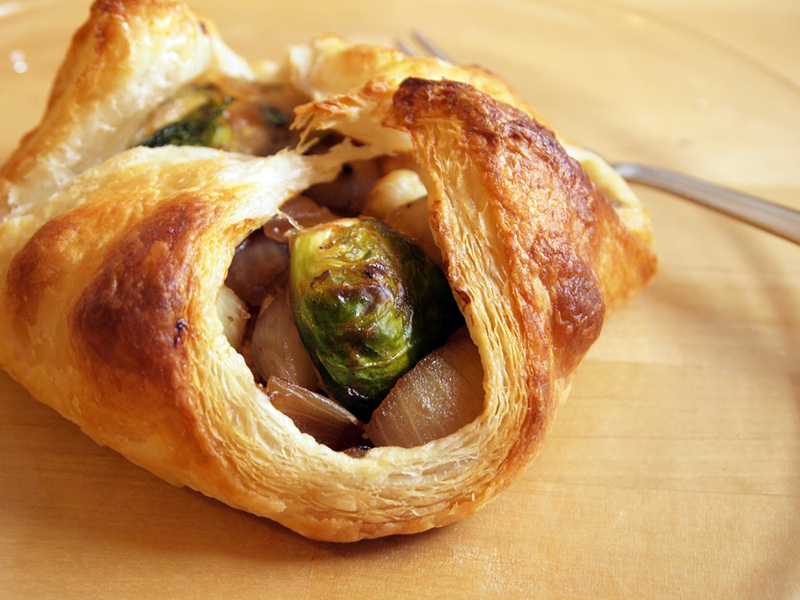 filled with carrots, cauliflower, brussels sprouts, shallots, mushrooms and roasted garlic. Probably our favorite of all the dishes we made, it's from Vegetarian Times. It took some work, but it made 8 squares - enough for four meals! Not too bad. Now it's back to work for us (well, we technically went back to work on Friday) - soon to come: more new wedding suites and a whole boatload of new fonts for future wedding suites. Let the holiday season begin! 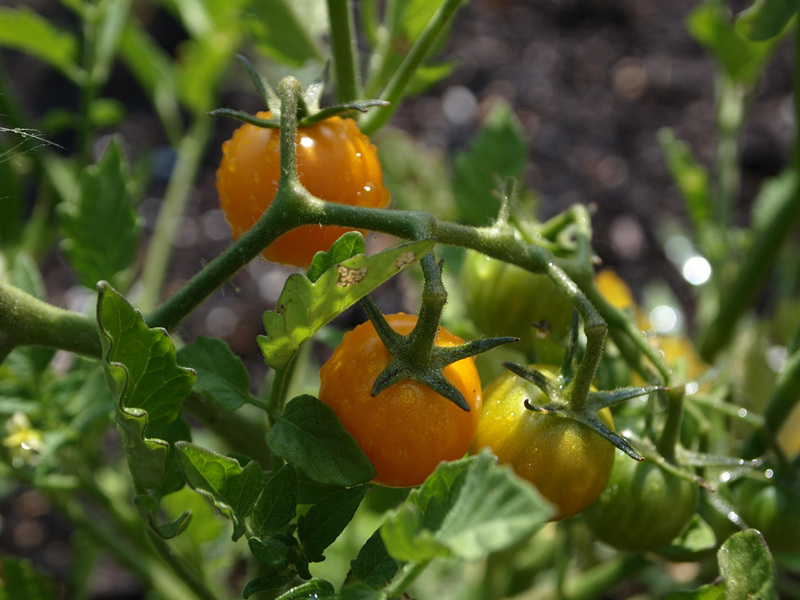 We first found these orange cherry tomatoes growing in one of the mulched-over paths in our garden - it's apparently a very hardy variety, left over from whoever had the plot before us. Week by week, more and more little tomato plants appeared, until we'd gathered five volunteer tomato plants and put them in a tiny bed where the bok choi used to be. Time to flip through our seed catalogs and figure out what kind they are - they're really tasty! 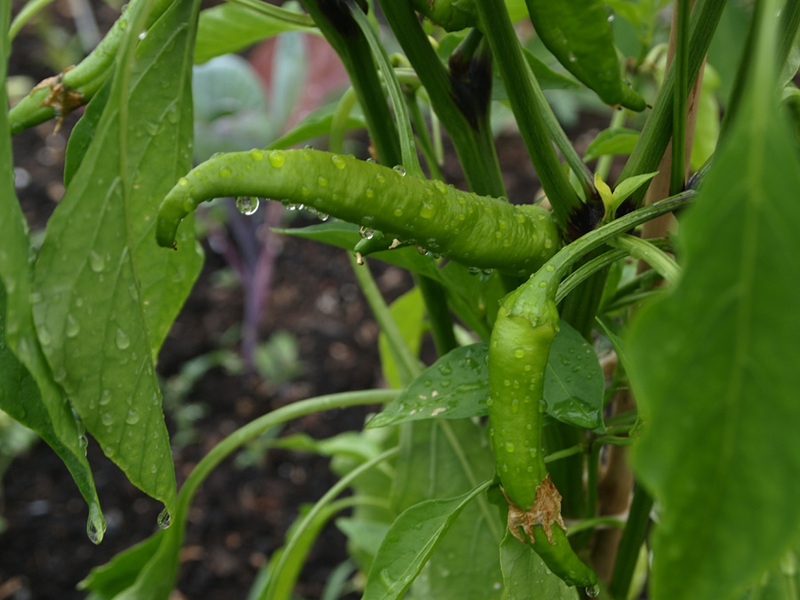 These are Jimmy Nardello peppers, which are sweet and supposed to be really good for frying - we started them indoors from seed and have watched them get really huge since planting out, much bigger than the plants we got from the garden center. Two more fruits, almost ready to be picked! 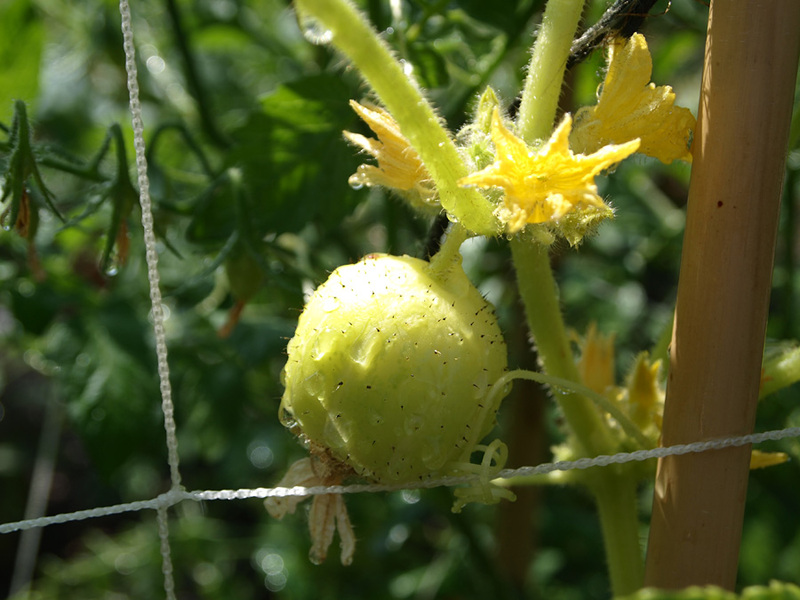 Lemon cucumbers and black krim tomatoes. We decided that next year, if we aren't able to get a bigger garden (ours is only 10x20), we're only going to grow crazy heirloom veggies that would cost a lot of money to buy. Like these two! And like our favorite beans of the summer - Dragon Tongue. 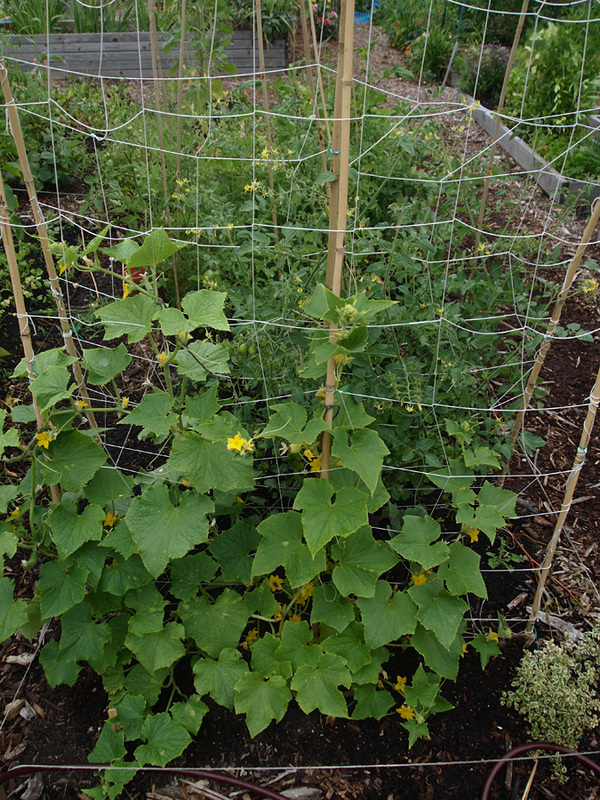 We decided to try training the cucumbers up a trellis and I'm so glad we did - they hardly need any tying up and we've saved so much space without their vines trailing everywhere! 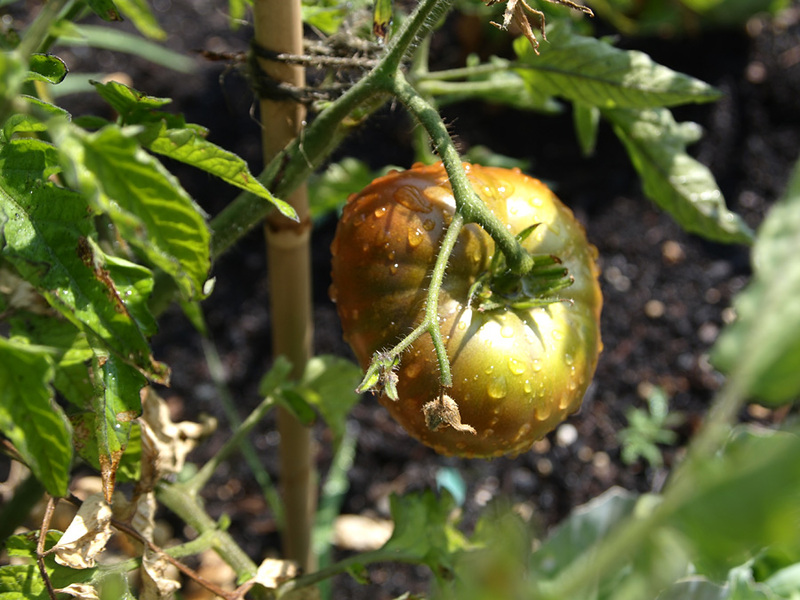 We also don't have to worry about pests and diseases so much since everything is up off of the ground. It was really easy - most of them started climbing without any help from us, and those that didn't just require a tie here and there. 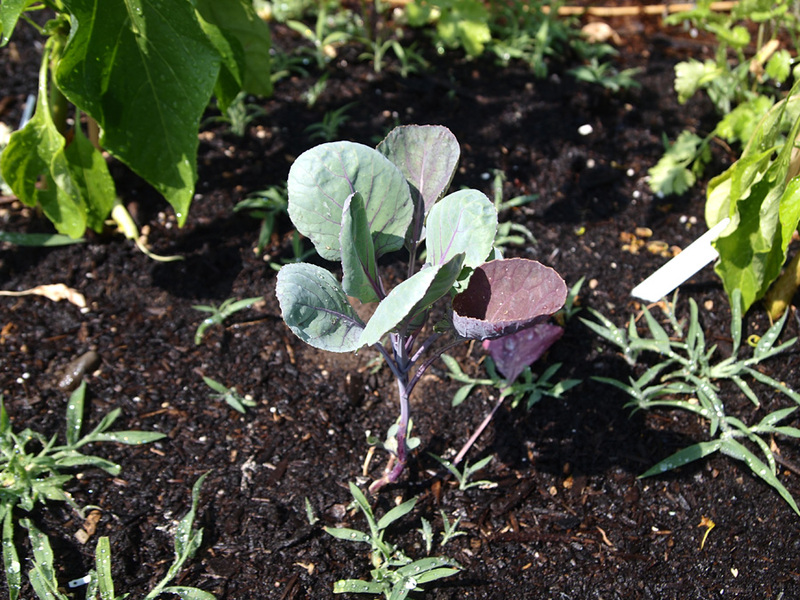 We've started some fall plants in our garden - these brussels sprouts were transplanted almost a month ago. We just received about 15 packs of seeds in the mail for fall and winter gardening, so as soon as this heat wave passes, we'll be out planting away! 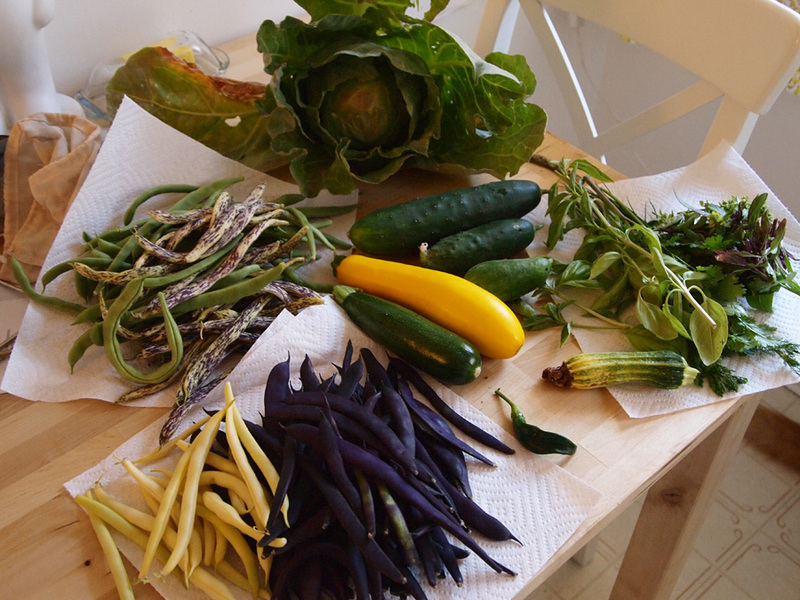 One of our harvests from last week - we've gotten much more since (I think it's time to freeze or can some beans!). This week, it's supposed to be over 90F four days, which is super hot for here, so I think we'll be staying away from the garden except to water. We might even sneak away to the coast, where it'll be a lovely 20 degrees cooler. In the meantime, we're still working on new stationery for autumn - updates to come soon!